There are 12 reviews of Loud for Him. Tommy Hilfiger Loud for Him opens with a burst of sweetness that quickly (within a few seconds) changes into a rose/citrus pairing, and within minutes after that, dries down into a rose mixed with dried fruits. I know that patchouli is emphasized in the notes breakdown, and especially in the production (YouTube the first part of a BBC Perfume documentary), but I definitely don't get much patchouli at either the opening or in the drydown. Projection is only noteworthy in the opening minutes and longevity is weak, as this becomes a skin scent within an hour of applying. Luckily, it's cheap ($10ish for 50ml on FragranceNet) so it can be reapplied without regard for quantity, but it's on the weaker end of even relatively cheap designer EDTs. If you like the rose/citrus opening and enjoy the dried fruit accord in the dry down, this might work for you. While I usually abhor the dried fruit dry down, I'm receptive to it enough here that I'll keep the small bottle I blind bought, but this certainly isn't a designer standout. Like a modern version of Givenchy Gentleman, which I love - this is more rosy and has a more leafy, less woody base - both have a hefty hit of Patchouli, though this doesn't make you feel like you've stepped into a time warp. Let me start off by saying, I enjoy Hilfiger fragrances. They are as designer as can be, yet they take risks, and in most cases end up with a unique but safe fragrance. At least in the past they have, with stuff like the original Tommy, and True Star, but some of this newer stuff has been pretty bad. 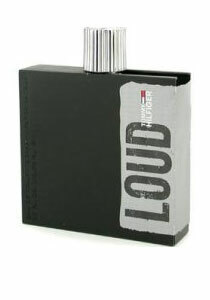 Loud came out in 2010, right around the time they start transitioning over into just boring mediocre fragrances. Loud is a very boring fragrance, very safe. Amongst the opening, I get this fruity, jammy rose note, which is pretty nice, very fruity, but goes away quickly unfortunately. It fades into mostly patchouli -- the patchouli note is very wearable though, it isn't heavy, but it is the dominating note. There's still some rose here, but it's more of a naturally sweet rose, and since there is so much patchouli, it's pretty hard to detect the rose. As it dries down, this dirty dry tobacco note emerges and mixes in. I also detect a little vanilla in there in the base. Fragrantica lists only 3 notes, rose, patchouli, and tobacco, and I agree, those are the main notes here. The smell is familiar, it's not anything new. It lasts about 4-5 hours on me, with minimal projection, but good sillage. The sillage I know is good because I got a compliment when walking by somebody, but I know I cannot smell it radiating off my skin, only when I stick my nose into it up close. 10 bucks for a bottle is a fair price. Anything more than that isn't worth it, so don't bother. First “Bang,” now “Loud.” Do these names signal a trend in male perfumery? Apparently not, as Loud has little in common with the brash but one-dimensional peppercorn and woody amber of Bang. Instead, Loud is an utterly nondescript fresh citrusy-aquatic sports fragrance, interchangeable (except for packaging,) with any of a hundred others on the market. A shot of lemon and a dash of Calone shaken over some artificial “wood” base notes and voilà: you’ve got Loud. Luckily, the scent is loud in name only, so we’re at least spared the unpleasantness of perceiving its banality at greater intensity. The talents of Aurélien Guichard and Yann Vasnier were utterly wasted on this effort. Now I wonder if “Crash” and “Boom” will smell any more interesting when they inevitably follow? Very nice modern masculine floral scent. The patchouli and tobacco are giving the right amount of depth to the rose top note. The first TH scent I like! Loud is a soft lovely tobacco frag on me anyway. A gorgeous floral and tobacco sillage. Very pleasant indeed. A great one from T.H. There are no member images of Loud for Him yet. Why not be the first?